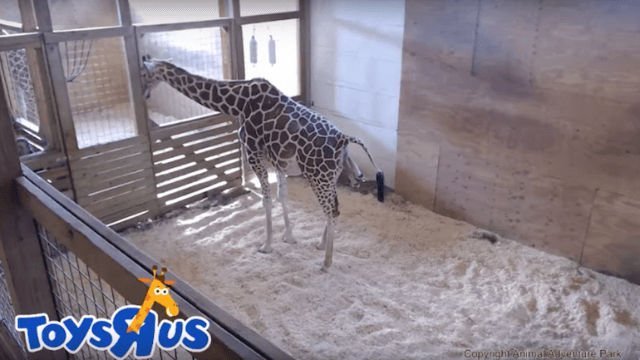 This is not a drill: April the giraffe is finally having her baby. Non-believers and April the Giraffe conspiracy theorists: it's time for you to eat crow, because the lady is in labor and there are officially little legs poking out. That's right, the supposedly pregnant giraffe at Animal Adventure Park, who sparked outrage for being pregnant for so GD long, is officially, finally giving birth. In related news, I have to say this sponsorship of the live stream by Toys R Us has to be the smartest advertising move the toy company has ever made. Millions have tuned in to check the live stream since it was announced back in February that she was going to give birth at any moment. Turns out it took April longer than expected, which means that people were compulsively checking the live stream to see if there was any movement, and feeling pretty pissed that April wasn't having that baby (I do not understand how this became such a thing, but it did). Maybe Toys R Us paid April to take months longer than expected to have this baby. Regardless, it's finally happening and people are tuning in. Can you imagine having legs hanging out of you? I can't! Good luck to April in this long-awaited birthing process. Now, I'm off to Toys R Us for some reason!